Neil Cornrich & NC Sports, LLC: Are former track athletes more prone to fumbles in NFL? Are former track athletes more prone to fumbles in NFL? A Wall Street Journal report posed an interesting theory about the New York Giants’ David Wilson‘s trouble holding onto the ball in the season opener Sunday. Wilson, and some other running backs, may be more likely to fumble because they grew up running track. Wilson lost two fumbles in the Giants’ loss to the Cowboys on Sunday. He was sixth in the triple jump (16.20 meters) at the NCAA Outdoor Championships in 2011 and could run the 100 meters in 11.01 seconds. The Buffalo Bills’ C.J. Spiller fumbled on his second carry in a loss to the Patriots on Sunday. He was a track and field phenom in high school in Florida, wearing golden shoes in sweeping the 100 and 200 at the Class 2A state meet in 2006. He ran the 100 in 10.29 and the 200 in 20.96 at Clemson. The Arizona Cardinals’ Alfonso Smith fumbled in a loss to the Rams on Sunday. Smith ran the 100 in 10.52 in high school, winning a Kentucky Class AAA state championship. “If the individual comes from a track and field background, certainly it may have created a situation which needs to be addressed for football,” Peter Thompson, a longtime coach and former official for the IAAF, told the Wall Street Journal. 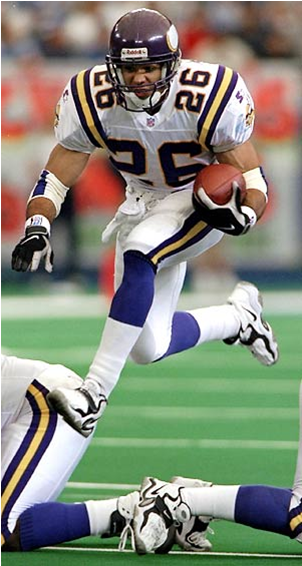 Thompson pointed out how running backs are taught to run tight, with the ball pressed against their bodies, while sprinters are taught to run loose. “Tightening up” is a term used in track and field to describe runners losing their form toward the end of races. The report also looked at the obvious differences in the way running backs carry the ball and sprinters carry a baton in a relay. Also, the athletes’ eyes. In the NFL, it’s key to have as much of a vision across the field whereas in track one is focused on a single lane. Curtis Dickey ran the 100 in 10.11. He fumbled 33 times over 1,075 touches in a seven-year NFL career in the 1980s. That’s an average of three fumbles per 100 touches, a little bit higher than the NFL average at that time (about 2.5). Robert Smith ran the 400 in 45.73. He fumbled nine times over 1,609 touches in an eight-year NFL career in the 1990s. That’s an average of .6 of a fumble per 100 touches, way lower than the NFL average at that time (about 1.5). In fact, Smith carried 232 times in the 1997 season and didn’t fumble once. The next highest back that season with zero fumbles had 136 carries. James McAlister long jumped 8.24 meters. He fumbled 12 times over 251 touches in a three-year NFL career in the 1970s. That’s an average of almost five fumbles per 100 touches, way more than the NFL average at that time (about 2.6). Spiller ran the 60 meters (indoor) in 6.58. He’s fumbled 11 times over 591 touches in an ongoing four-year NFL career. That’s an average of about 1.9 fumbles per 100 touches. Pro-football-reference’s blog item on fumble rates only goes through 2007, but at the time the NFL average was trending down toward one fumble per 100 touches. So, Spiller’s fumble rate is high. There are several potential flaws in fumble stats, but among the small sample size of the most elite track athletes to play in NFL history, it appears there is a higher propensity to fumble. Except for Smith, who would be the most reliable case study since he had the most carries out of this group.